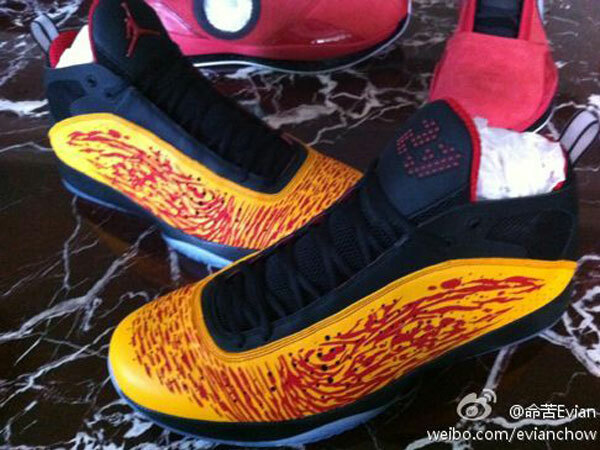 Another Dwyane Wade player exclusive Air Jordan has surfaced on the web, this time in the form of the Air Jordan 2011. Another Dwyane Wade player exclusive Air Jordan has surfaced on the web, this time in the form of the Air Jordan 2011. Worn by Dwayne Wade in several colorways during the 2010-2011 NBA season, this was one of the few pairs of the Air Jordan 2011 that never found it's way on to DWade's feet. Matching the Miami Heat's road uniforms, this DWade player exclusive is done up in a combination of black, varsity red and yellow. Black is seen working the entire tongue, ankle area and midsole, while yellow and varsity red combine on the unique overlay to create the vibrant look. Varsity Red also works the tongue logo and liner, while a clear outsole holds it all down below. Enjoy a look at this never before seen Dwyane Wade Air Jordan 2011 Heat PE below. Unfortunately, an official release is not expected for these gems.